Channeling the beautiful love, and frequency of Archangel Haniel is truly an incredible experience. Haniel vibrates with incredible love energy, with joy, vitality, and passion for life… But for me the most noticeable characteristic is the incredible energy of the Divine feminine that exudes from her presence. Yes, you read that correctly… I see and experience Archangel Haniel as being female. Of course, the reality of Archangels is that they're neither male or female… But certain Archangels like Archangel Michael always feel very masculine to me when I connect with their energy. Archangel Haniel on the other hand is incredibly gentle, nurturing and distinctly feminine. But while Haniel is gentle, loving, and incredible nurturing when she flows her soothing energy, and emotionally healing light, she also has a sort of electric energy and wildness about her… She has a fiercely powerful intensity that is incredible and she's always available to fly deep in the the heart of heaviness, unafraid of messy emotions, challenging times, and sticky situations because she has the power to help shift all of these things. I am honored and grateful to have Haniel looking out for me, and watching my back, and if you feel drawn to Haniel, she's always willing to help those who call upon her with sincerity, openness, and a willingness to heal, grow, and transform. Haniel is a hugely powerful ally for anyone dealing with heavy emotions, struggling with women's issues, sensitivity, or those who know they're meant for so much more and are having trouble rising to the occasion and stepping into their full light. Haniel also assists with new beginnings, helping those who call upon her with aligning with good luck, and creating positive change. She offers protection, harmony, and grace and will assist you in staying poised and centered in the midst of whatever is happening in your life. When called upon, Archangel Haniel will dive into those lower energies and heavy emotions you may still be carrying, cleansing and transmitting all worry and lower vibrations back into love with her blue orb of healing light. Call upon Archangel Haniel and imagine her pearly blue and white orb of light all around you, to activate your innate healing abilities, tune into strong moon energy, cultivate your inner strength, and your boost your psychic abilities like intuition and clairvoyance. 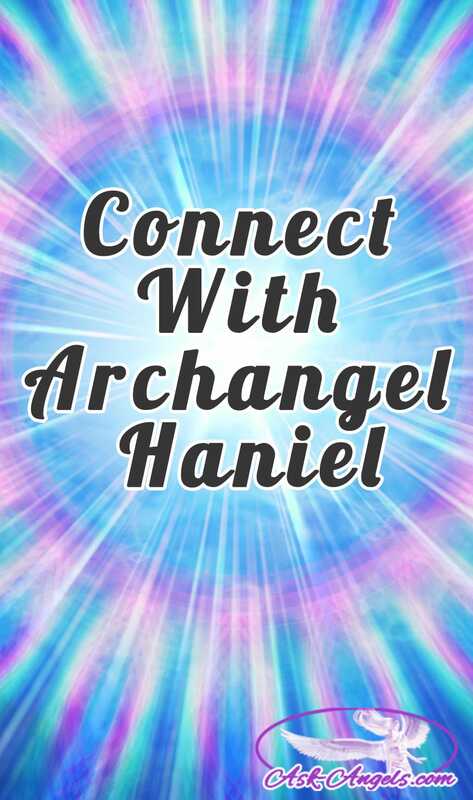 Ready to get to know Archangel Haniel? Invoking the presence of Archangel Haniel is as easy as asking her to be with you. You can also invite Archangel Haniel to help heal and uplift others! In addition, the angel messages I've channeled with Archangel Haniel carry her vibrational energy signature and presence. Listen to the Free Angel Message .MP3's with Archangel Haniel belowto lift your energy into vibrational resonance, and to tune into the light, love, and power of Archangel Haniel now. 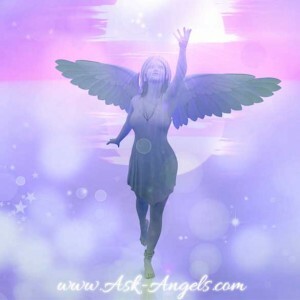 These angel messages will not only connect you with the love and presence of Archangel Haniel, but will also guide you to more clearly connect with your own Angels and Guides. Set to beautiful music from Thaddeus, these uplifting angel messages will leave you feeling refreshed and well connected. Click the link above to listen or right click to save to your computer. If you like the messages above check out the Ascension Meditations Pack which you can access by Clicking Here! Or for the Love Meditations Pack… Click Here! What a so beautiful, wonderful and blessed message. Thank you, thank you and thank you Melanie. Do you believe it possible for one to be a reincarnate of Archangel Haniel? Perhaps not a full reincarnate, but born with part of her soul? I ask because I have a friend who claims to be such. They have memories of heaven and of their life as the archangel that they couldn’t explain for most of their life. Thank you in advance – if this even gets a response. Yes, this is possible… Not a full reincarnation as you say, but a fractal of Haniel born in the physical yes. I have my over soul at the 7th dimension. I have with me the Archangel Azrael who personally protects me until the day I leave Gaia to return to being completely with myself as the Angel of Joy. Hi :: The work of Ask-Angels.com is changing lives! Thank you !! Thank you Melanie, this meditation came just in time and was perfect for me. When you first began telling us about Archangel Haniel, I immedietly felt pulled to her. This is just really so Divine! Awesome, Melanie! Thank you so much for this. One question: do you feel that Archangel Haniel would be a good one to invoke for issues related to sexuality and being of non-standard orientation, as this relates directly to the Divine Feminine? Thank you Melanie. My favourite crystals that I use to connect with Haniel is moonstone and pearl. Haniel has a beautiful calming and caring quality that makes me feel safe. Can you please tell me which crystal is connected to Archangel Haniel please? Thank you and God bless. Thank you for your messages I am deeply grateful for your guidance in helping me to connect with my angels and Archangels. May you be blessed in all you accomplish. Thank you! Many blessings of love and light flowing your way as well!